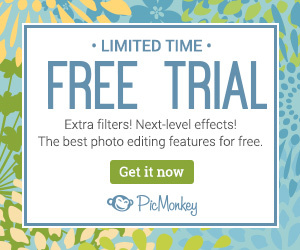 A few months ago I wrote about how PicMonkey Solved My Graphics Problems. 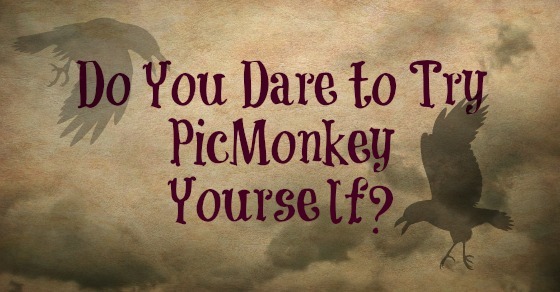 In that post I talked about my new obsession with PicMonkey. I showed in that post how I could make graphics using the Collage tool mainly. Little did I know just how much I would love the Design Tool! 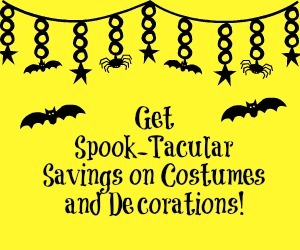 In the past I have mainly used Fiverr to get quick basic graphics to use for holidays. Or I created them myself in Photoshop and they were passable but clearly not professional. 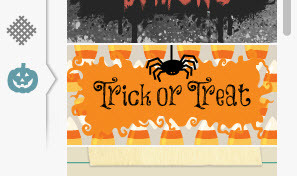 When I saw that PicMonkey had added Halloween specific tools, I decided to give them a chance. After I click on the Design Editor, the first thing that I do is set the dimensions for my image. This is under “Basic Edits” (the symbol that looks like a crop tool) and then “Resize.” As I mentioned in my other post, I use 560×292 1120×584 for images that I want to use in blog posts and appear nicely on Facebook or Google+. I also experimented with some standard banner sizes to use in my sidebars. Essentially you can make the images any size you want. 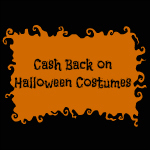 (There are other themes that will create really cool Halloween images as well including Zombies, Witches, Vampires, and Demons). That was really basic but only took 30 seconds. You could make just about any kind of button with it. All of mine were done without bothering to watch any of their tutorials. I’m sure if I took the time to watch any of their tutorials, I could do even cooler stuff. 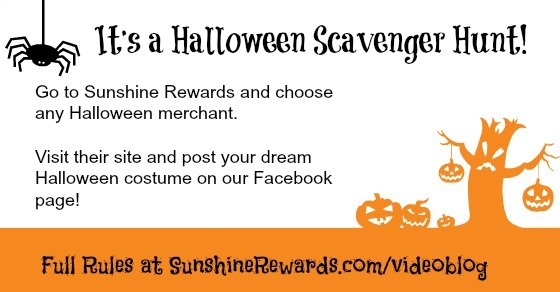 They even have a whole series of Halloween blog posts to help you get creative. Some of the themes, overlays, texts, etc. are free and some of them are part of their Royale package. At $4.99 for a month, it is definitely worth the upgrade! 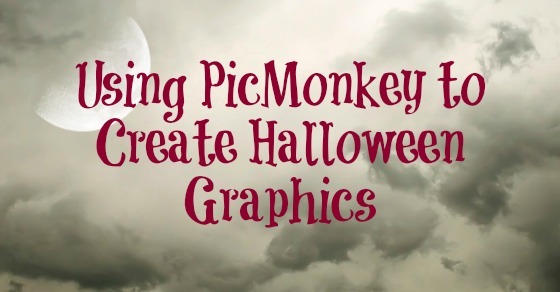 If you are like me and just need simple graphics but need them frequently enough that you need to learn to make them yourself or spend a fortune, I wholeheartedly recommend giving PicMonkey a try. And I look forward to dazzling you with my increased PicMonkey knowledge over time. 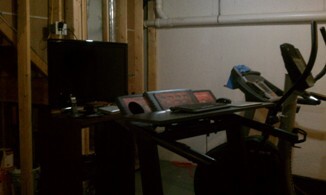 I get a lot of questions about my treadmill desk and how it works. All of the treadmill desks that I looked at were pretty expensive, and I didn’t know if I would really even use one. So my husband and I decided that we would try to build one using an older treadmill that we didn’t feel comfortable running on anymore. In the first picture you can see the basic setup. We basically drilled 2 shelf brackets ($7 each at Home Depot) into the top of the treadmill and placed a wireless keyboard mouse on top of a plain wood shelf ($10-$20 at Home Depot depending on the size and type). You could use a SurfShelf if you didn’t want to try to make one yourself. We already had a television in the “exercise room” (unfinished basement), so we just plugged one of our laptop docking stations into it. I simply take my laptop from the docking station in my office to the docking station in the basement to keep working. If you don’t have any of the above already, you can always go the TrekDesk route for about $500 (available from Amazon). 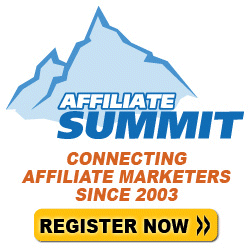 As an affiliate marketer, I get to know hundreds of online merchants. I see their prices, their coupons, their shipping policies, and what my members say about them on a daily basis. It’s not very often that a merchant makes me so angry as a customer that I am willing to completely out them on one of my websites. But today is that day for Kmart. I was never a Kmart shopper. I didn’t go to my local Kmart before it closed. I’m mainly a Target girl. However, they were giving us some good promotions at Christmas and so I wanted to send them some of my business. I ordered a sleeping bag for my daughter as one of her main presents. She only likes pink and purple, and it couldn’t be too big. I was picky, but Kmart had what I needed. I was excited and placed the order, only to find out a few days later that it was canceled. I ended up at my local Target a couple of days before Christmas buying a replacement. Strike one for Kmart. Fast forward a month. My daughter is a huge fan of Wizards of Waverly Place and Kmart has a good deal of WOWP merchandise. I launched a new website and prominently featured their products. Valentine’s Day was coming and I wanted something WOWP for my other daughter. I visited Kmart and placed a number of things in my cart. When I went to check out, one was out of stock. So I added something else to even out the gifts for my two girls. When I went to check out, something else was out of stock. So I had to keep shopping. I finally placed the order and at the same time that I got the order confirmation, I got a notice that one of the items that I ordered was already out of stock! Strike two for Kmart. Again I went to Target locally to buy a gift to even up my two daughters. As I was wrapping gifts today, I realized that one from Kmart was still missing–the WOWP bracelet that was the main gift. I checked my order online and Kmart was still showing that it was part of the order. No cancellation. I checked my credit card and the full order amount was billed. So I called Kmart to find out if they could give me the tracking number. Turns out they canceled that item but their system is not set up to always kick out a cancellation message. Further, they charge the card first and then check the inventory for Sears products. Now I have to wait for a credit (and the last time that I had to wait for a Sears credit, it took multiple calls and weeks to get my money back). Strike three for Kmart. The worst part of all of this is that Customer Service told me that they have known since November that they have website and inventory issues. They only update their inventory every 24 hours. As a consumer, I’ve placed orders for 3 items in 2 months that were not in inventory. Think about how many products I have sold through my websites that I ended up not getting paid for due to the same issue, not to mention the frustration of my visitors. Customer service told me to feel free to email them with my complaints so that they can have them “on file.” The best that they could do was tell me that they were sorry and I would get a credit back within a couple of weeks. I told them I would send them a link to my story once I put it online instead.